One of a kind cabinet, originally commissioned by Marsha. This is a very large freestanding armoire for jewelry and lingerie storage. 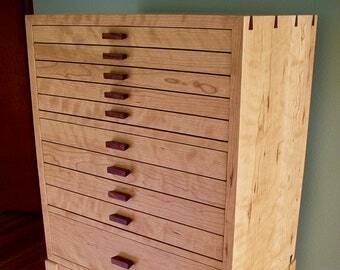 Contains twenty-eight jewelry drawers behind two locking doors, and three larger drawers below for clothing. ~Solid cherry case and solid ash interior parts. ~Multiple coats of pure shellac finish, hand rubbed to a satin finish. Made from a group of boards from the same log, so as to ensure uniformity of figure and color throughout the piece. 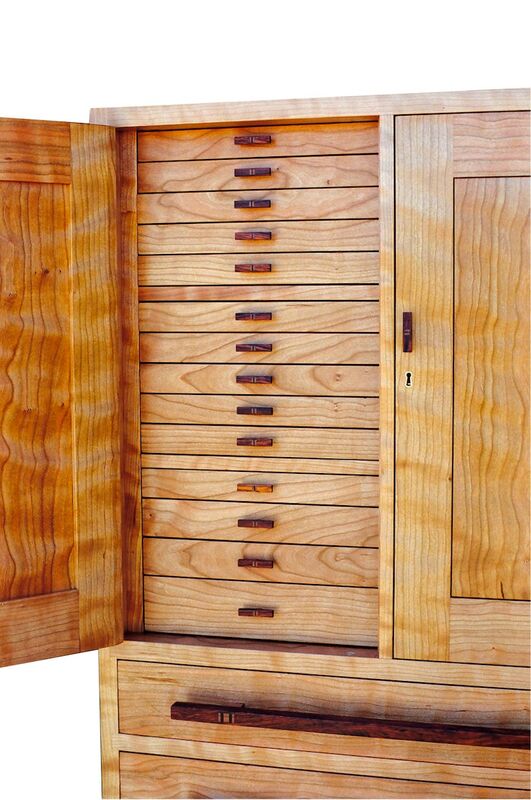 Customized solid ash dividers are installed in all 28 drawers. Large jewelry armoires are made to order, designed specifically for your needs. This type of piece can be made in a variety of species, configurations, styles, and prices. If you are interested in a large jewelry armoire like this, don't hesitate to contact me. This is the all options package, but there are many possibilities. This cabinet can also be made for mineral storage, as a specimen cabinet, sheet music storage, etc. Inquire. We ship worldwide. Contact me for a shipping quote.